Muskegon protected the only perfect record in United States Hockey League’s Eastern Conference Sunday night, but it was not easy. After giving up the game’s first three goals in the first period, the Lumberjacks rallied past the Youngstown Phantoms 5-4. The Eastern Conference leaders improved the league’s best record to 6-0-0-0. Cam McDonald tied the game early in the third period and 2018 U.S. Under-18 Men’s Select Team center John Farinacci, one of five Lumberjacks with two points, scored the game-winner with 12 minutes left. Craig Needham’s two short-handed goals had helped the Phantoms open their 3-0 lead. The first Muskegon win of the weekend was much less stressful. Danil Guschin had a goal and two assists while Michigan native Jagger Joshua, one of four players with two points, scored two goals in a 6-0 shutout of the Chicago Steel. 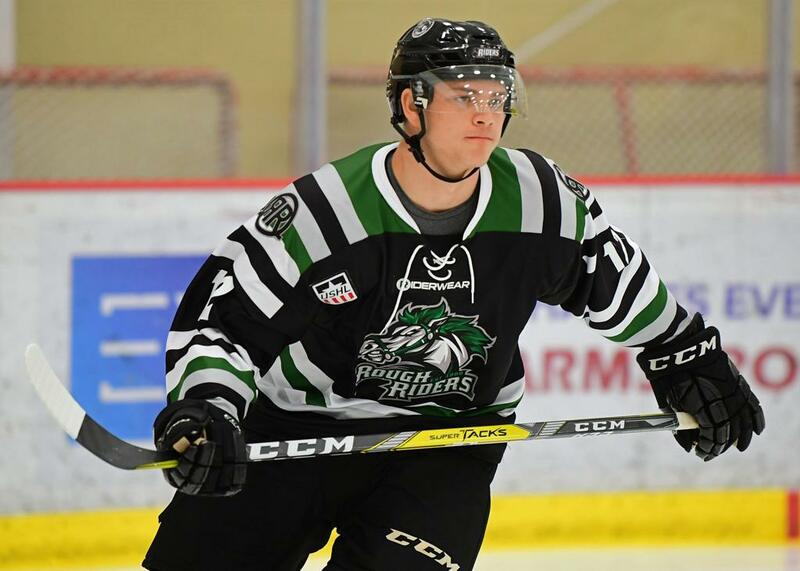 Joshua’s older brother, Dakota, currently skates at Ohio State University after authoring his own successful stint in the USHL with the Sioux Falls Stampede from 2013-15. STILL UNBEATEN: The Tri-City Storm are perfect through five games to lead the USHL Western Conference. USA Hockey’s National Team Development Program, which is tied for second in the Eastern Conference with games in hand over the others in the tie, is 3-0-0-1. The Waterloo Black Hawks are tied for third in the Western Conference, but are the USHL’s other team that has not lost in regulation. The Blackhawks are 2-0-2-1. USHL LEADERS: Green Bay’s Nick Leitner leads USHL defensemen in scoring after picking up five assists while leading the Gamblers to a pair of weekend wins. Leitner, a Bemidji, Minnesota, native who now has seven assists in seven games, had three in Friday’s 6-2 win over the Central Illinois Flying Aces. He had two more Saturday in a 5-4 win over the Waterloo Black Hawks. Tri-City goalie Isaiah Saville leads the league with a 0.67 goals against average and .970 save percentage. He allowed one goal in each of his first two USHL starts before posting a 25-save shutout in Friday’s 3-0 victory over the Des Moines Buccaneers. Saville helped backstop the 2017 U.S. Under-18 Men’s Select Team at the Ivan Hlinka Memorial Cup. New Jersey native Matt Brown of the Des Moines Buccaneers leads the league in goals (six) and points (11) through six games. DOUBLING UP: Thomas Magnavite posted a hat trick in his debut for the North American 3 Hockey League’s Coulee Region Chill, then went back out the next night and did it again. Magnavite also had two assists in Friday’s 10-1 romp over the Wausau RiverWolves. The Chill then made the most of Saturday’s home opener, handing the Milwaukee Power their first regulation loss in 11 games this season, rolling to an 11-3 Central Division victory. Magnavite, a 19-year-old from Chicago who had 26 goals in 35 NA3HL games for the La Crosse Freeze last season, also had an assist in the win over Milwaukee. Massachusetts native Marc Faia, the NA3HL scoring leader with 32 points in 11 games, has received back-to-back Coastal Division Star of the Week awards after producing five goals and six assists in three wins by the Northeast Generals last week. COLLEGE COMMITMENTS: Three North American Hockey League players are among those who have recently announced college commitments. Topeka Pilots defenseman Max Finner is headed to Ferris State University, Minnesota Wilderness goaltender Kaleb Johnson committed to the University of North Dakota in his hometown of Grand Forks, and Corpus Christi Ice Rays defenseman Brian Kramer is going to Robert Morris University in his home state of Pennsylvania. Finner, a 19-year-old from Elmhurst, Illinois, has two goals and eight assists in 11 games. He played in 57 NAHL games last season, scoring 18 points for the Topeka RoadRunners. Johnson, 17, is 3-1 with a 2.00 GAA and .933 save percentage. Prior to playing in the NAHL, he helped the Grand Forks Central Knights claim two North Dakota state high school championships. Kramer, 18, from Wexford, Pennsylvania, has four points through 10 games. STILL SCORING: Jake Adkins had points in the first nine New Hampshire Avalanche games this season. The first time he did not score an official point, all Adkins did was produce the winning goal of the shootout in an Eastern Hockey League victory over the Philadelphia Little Flyers on Sunday. ONE-TIMERS: Adrian Danchenko had at least one goal and one assist in each game while helping the Wilkes-Barre/Scranton Knights take two out of three games from the Northeast Generals in a weekend NAHL series … Devin Phillips had seven goals and seven assists for the North Carolina Golden Bears in a three-game EHL sweep of the Lehigh Valley Jr. Rebels … Luke Hartge was scoreless in his first three games for the NA3HL’s Yellowstone Quake, but has eight goals and an assist in four games since … The EHL will send an all-star team into a pair of exhibition games against college teams, playing Plymouth State Saturday and UMass-Boston Sunday.